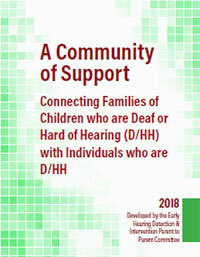 Connecting Families of Children who are Deaf or Hard of Hearing (D/HH) with Individuals who are D/HH. To share information about the positive aspects of connecting families with deaf and hard of hearing adults and community members. To describe several ways systems can provide and facilitate these connections. These approaches can be used in any combination, and they can be used at different points in a family’s experience. Families should be able to choose the combination(s) that suit their situation. All families, regardless of degree of hearing loss/level or communication/language of the child, should have the opportunity to interact and learn from D/HH Adults; this may include formal to informal interaction, from high level interactivity to low, etc.